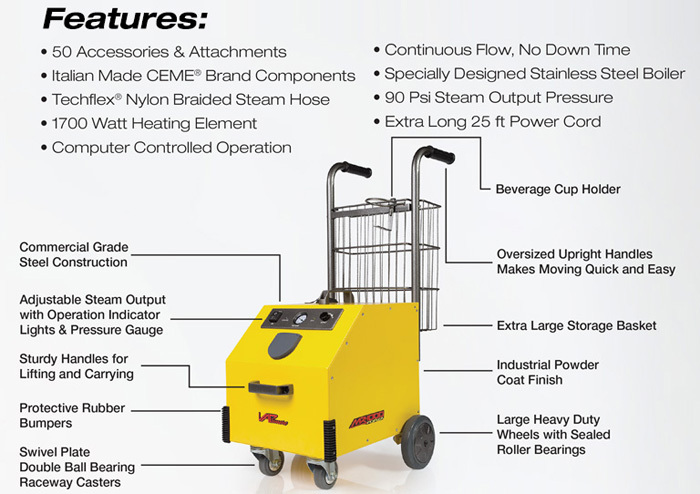 The Vapamore MR-1000 Forza Steam Cleaner is Vapamore's flagship steam cleaner. Engineered and designed with Vapamore's full experience of steam cleaning power, the Forza cleans, sanitizes and degrease surfaces with a powerful jet of 270 degree F steam. With 50 included attachments, the Vapamore MR-1000 Forza Steam Cleaner is ready to deliver professional results in your home, car, gym, workplace or anywhere else that would benefit. If you appreciate thoughtful design and professional construction, you will love the Vapamore MR-1000 Forza Steam Cleaner. The heart of the Forza Steam Cleaner is a super-powerful 1700-watt heating element which allows for a continuous flow of 270 degree steam. It features commercial-grade steel construction, Italian CEME internal components, a stainless steel boiler and computer control. 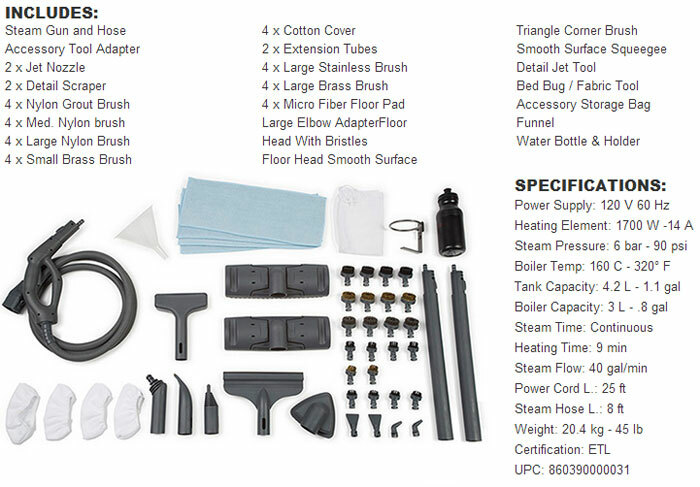 Furthermore, the Vapamore MR-1000 Forza Steam Cleaner features a life time warranty! Steam cleaners allow you to clean, degrease and sanitize without the use of chemicals. The Vapamore MR-1000 Forza Steam Cleaner delivers a powerful jet of high-temperature, high-pressure steam that gives it a professional cleaning action on interior materials. The high-pressure steam is also a powerful degreaser, making the Amico ideal for cleaning engine compartments and areas of heavy buildup. Use the Vapamore MR-1000 Forza Steam Cleaner in interiors, engines, headliners and more. It's not just for your car. This steamer is the perfect chemical-free cleaning solution for a variety of household applications, including grout, tiles, showers, toilets, stove tops, carpets, and more! *Discounts are not applicable on this item. This item ships from the manufacturer via ground service. Expedited and international shipping are not available.